This home already features a bold design, with bright colors and prints that contrast white walls and a tiled floor. 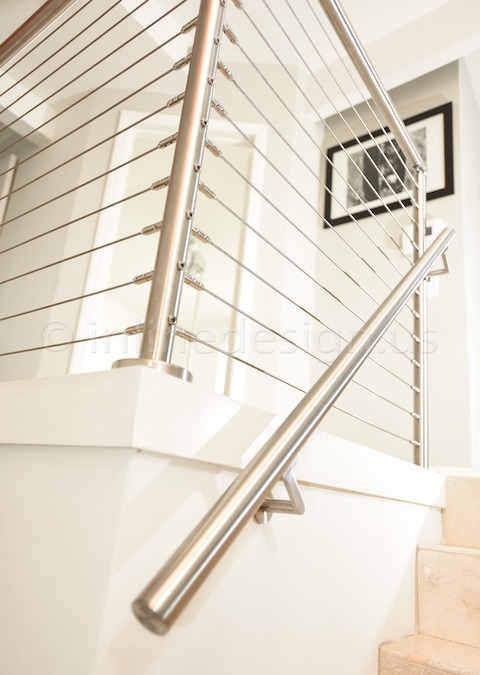 The owners sought a facelift for the stairs in their entry, and chose to go with a stainless steel round handrail, and use our San Francisco Round cable railing system on the landing. Inline Design receives many requests about the San Francisco cable system – customers looking for the most minimalist look find the through-bolted fittings attractive. This system can only be used on a flat surface, and landings like this are a perfect fit! These customers chose a creative way to incorporate a handrail on the second set of stairs, mounting a Gamma Quasar bracket, (U.S. Design Patent No.D781,688) directly to the post. This is a bracket that has four mounting variants: sheetrock/wood, flat steel, round steel, or glass! Can you spot the round saddle tube adapter in this photo? Inline Design includes a round tube adapter with each of these brackets. It sits in between the flat saddle and the tube to support the round handrail of your choice.